Arsenal: November Jinx Or a Coincidence? HomeBlogArsenal: November Jinx Or a Coincidence? Haaaaaaaaaaa! My heart! My chest! Seriously I am still under great shock. You will know what I mean if you watched Arsenal's game vs Wolverhampton Wanderers at the Emirates Stadium this evening. It's one that could cause a fragile-hearted human to slump. Arsenal drew their third consecutive match at home in all competitions - the last two came against Liverpool and Sporting CP in last two Saturday's Premier League and Thursday's Europa League ties respectively. They were so lucky to have escaped a shocker from today's visitors in what looked like an already lost battle. 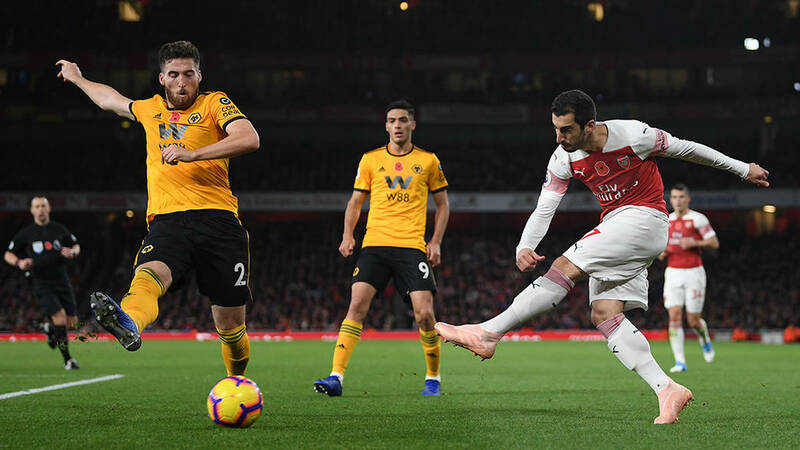 Thanks to Henrikh Mhkitaryan's late equaliser which ensured that the Gunners maintained their unbeaten run, making it sixteen straight games without defeat. Arsenal were trailing by a goal as early as the 13th minute through a close-range finish from Ivan Cavaleiro. The scorer retrieved a loose ball from Granit Xhaka, made some pass exchanges with Raul Jiminez then sent it to rest in the net. Even with more of the possession, we struggled against Wolves for they defended with fury and attacked on counters when the opportunity showed up. Arsenal came close to getting an equaliser through Alexandre Lacazette. Hector Bellerin's goalbound strike was also denied. The visitors came at us, posing a dangerous threat on a number of occasions but thanks to the class of Bernd Leno who would later emerge Man of the Match. Petr Cech should be really scared. This guy has taken over. He is here to stay. The first half ended with Arsenal sticking to the ugly record of a 'no win' in the first half in the League so far. In the next period more pressure was put in by Unai Emery's side. However, Wolves stood their grounds until the 87th minute when Mhiki equalised with a flick from the left side which went over the heads of those in the box and landed in the net. Now I was a bit relieved but still not comfortable. I needed a winner. Happenings afterwards started to make me satisfied with a draw as I wanted the game to end that way instead of us conceding at that crucial moment. My fears were confirmed later on as the visitors came close to getting an injury time winner but Leno stopped the first while the woodwork denied them another. The points were shared and Arsenal now sit at 5th position with three points behind rivals Tottenham Hotspur who we will play in our next two league games after we must have visited Bournemouth after the international break. This season so far, Arsenal and Watford are the only teams in the Premier League that have failed to take the lead at halftime. Something has to be done about our slow start to games. We were able to come from behind to win in previous games but have gotten nothing more than draws in all games played so far this month. Has the usual November curse sprung up again? I hope it hasn't.